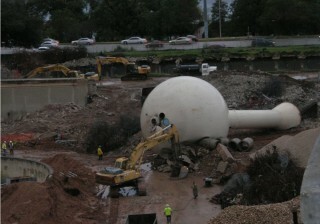 Here is a photo from November of 2009 of the dismantling and cleanup of the Austin Green Water Treatment Plant in Austin, TX. This photo looks south with Caesar Chavez Blvd. and Lady Bird Lake in the background. This water tower was a true water sphere. Not very tall, but notice the wonderful circularity of its dome. The tower was nicely maintained with very-well-done ghostly white for its mantle. This photo also gives a rare glimpse of the maintenance and access ports above a water tower, something that only birds and people in planes can spot. Doink! 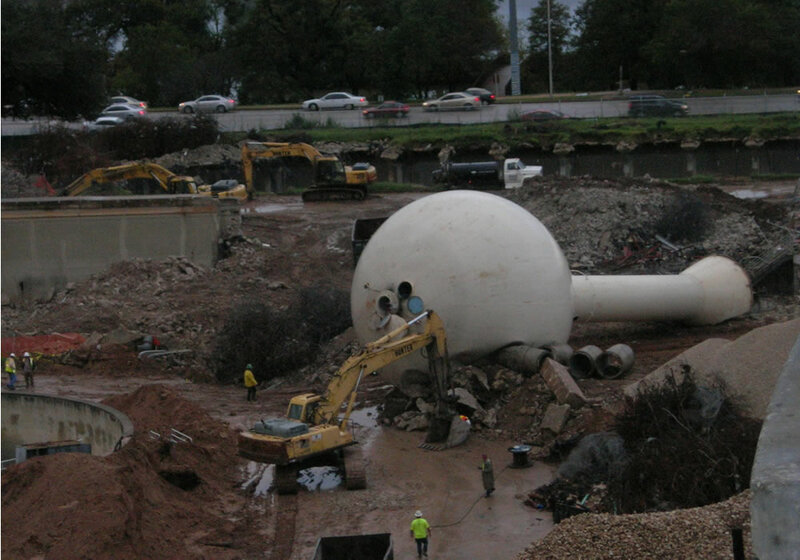 The fallen tower has landed on the cement pipes. Better get that backhoe to clean things up. This entry was posted on Sunday, April 14th, 2013 at 4:39 pm	and is filed under Experiences, History, Photos. You can follow any responses to this entry through the RSS 2.0 feed. Both comments and pings are currently closed.